Who’s ever gone to the bathroom at a public place only to sit down and find there’s no toilet paper in the toilet paper dispenser? Or you go through a beautiful looking store or a great restaurant and find paper towels all over the floor and a trashcan that looks like it hasn’t been dumped in days? Well if you said yes, you’re not alone. These problems happen to millions of people every week at a variety of restrooms across the country. Going into a dirty, filthy or not well stocked bathroom affects businesses in ways you wouldn’t believe. One survey said that 94% of respondents said that a non well kept bathroom would make them leave an establishment. Some believe that when going to restaurants a dirty restroom is a signal that the kitchen may not be that clean either. While there are people who will speak to a manager or an employee about the cleanliness of the bathroom, others are embarrassed to do so, or sometimes so grossed out they just want to leave. Well now there’s an app for that. The multi-platform Restroom Alert, is a way for customers to anonymously report to a manager, owner or other employee that their restrooms need some attention. It’s pretty simple. 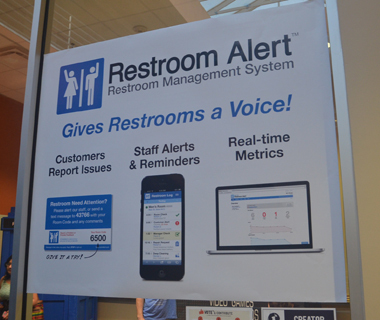 A business, small, big or gigantic, can sign up for Restroom Alert for $5 per month per room. The establishment will get signs that can easily be affixed to mirrors or walls with a short code to send a text message about the restroom. Does it need toilet paper? Do the sinks need cleaning? Is the trashcan overflowing? Is the toilet stopped up? All of these things and more can be reported anonymously via the text code. On the business’ side, they get a text message as well saying what needs to be fixed. At that point a timer begins and the platform records how long it takes to go fix the problem. The system can also alert owners, managers or employees when the restroom hasn’t been cleaned or checked in the allotted time. This wipes out the need for clipboards and paper restroom checklists, which often go unused. Restroom Alert even supplies analytics detailing the restroom problems, how often they’re stocked and checked and other key factors. A clean restroom is just another way a business owner can provide excellent customer service. Restroom Alert can be used by small mom and pop shops all the way up to Fortune 500 companies. The owner, or person in charge of such things, can get reports based on their entire network of restrooms. This way they can deal with employees that don’t give a crap about the way the restroom looks (you see what I did there). While there are plenty of apps that can find you a restroom on the road, this seems to be the first startup to modernize the restroom checklist. We got a chance to check out Restroom Alert one of the 464 projects found at OneSpark in Jacksonville. Check out our video interview with Rod Dornsife one of the co-founders of Restroom Alert below.